The first statistics for 2015 by the Statistical Institute of Belize (SIB) were released this week. 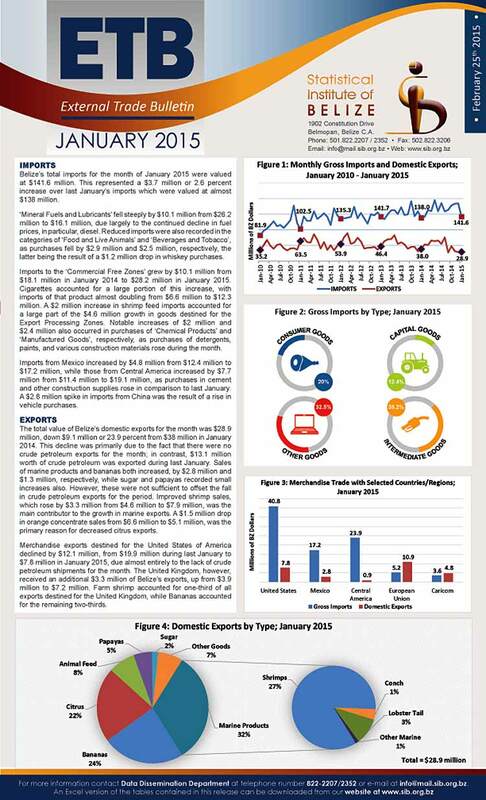 In the area of external trade, imports rose slightly and exports fell over the previous year. Belize imported $141 million worth of goods and exported just $28.9 million. There were no crude petroleum exports for the month of January, negating rises in exports of major commodities including sugar, bananas and marine products. There was a shift away from the U.S. as main export partner toward the United Kingdom (U.K.), mainly in farm shrimp and bananas. In the area of imports, Belize is importing less diesel, seeing a drop of $10 million in mineral fuel and lubricants, as well as less whiskey and food and live animals. However, the Commercial Free Zones are importing more cigarettes, shrimp feed imports and detergents, paints and construction materials, resulting in increases in these categories. Mexico, Central America and China (People’s Republic) account for primary trading partners in this period.Measured year-over-year, consumer prices fell by 1.1% in January, mainly due to lower fuel prices and food prices, particularly for staples such as red kidney beans and eggs. However, home rental prices are up 1.5% over last year. Punta Gorda Town saw an average price increase of 0.3%, the only municipality to do so. 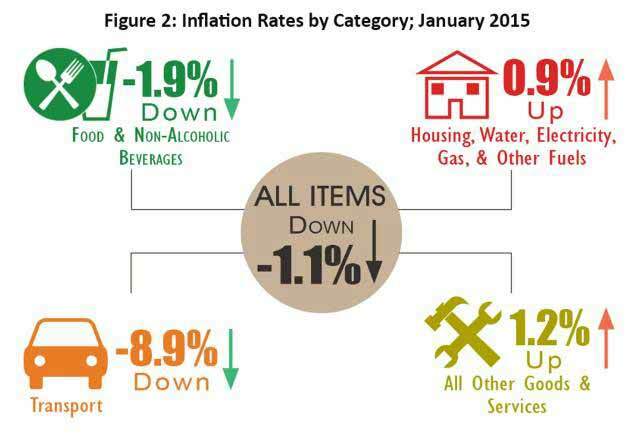 The central section of the country led the declines, with Belmopan’s prices down 1.8%, San Ignacio/Santa Elena 1.3% and Belize City 1.2% down from last year. 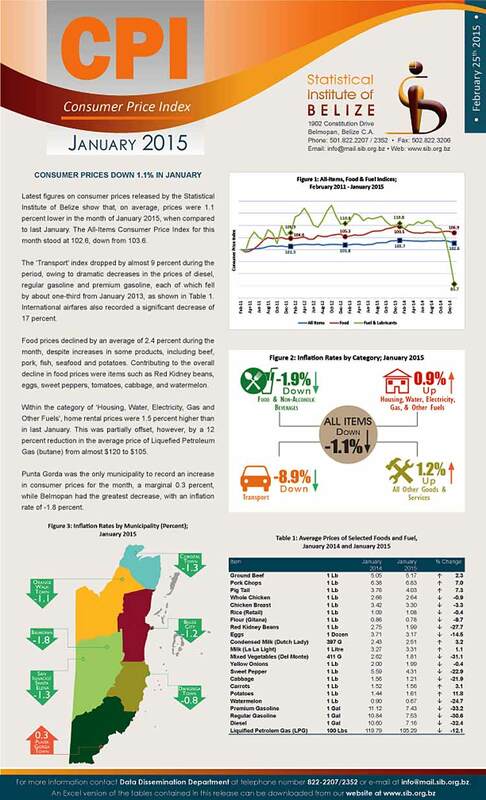 The Consumer Price Index and external trade statistics are released monthly and are available on the SIB website.